A big shout out to all the Horse Fair coordinators, participants and volunteers. It is a huge effort to pull off and you do it beautifully year in and year out. Meet our participants in April's newsletter . Check the front page of our website for a complete schedule of events. Posted on April 12, 2019 by Heidi Harvey. Our club members have several well trained Morgans for sale right now that you can ride, drive, take on trails, or show. Look at our classified section for photos and more info. Dancastle Legend is one of many fine Morgans available for sale. The club recognized long time members Marie Stewart and Jim Harris with Master’s Certificates which are given to members age 60 or better who have been active in the club and with Morgans in breeding, training, showing, and promoting the breed. 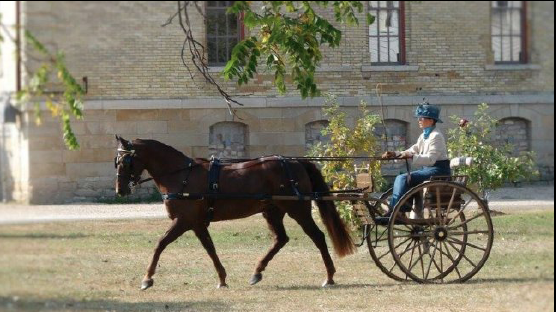 Marie has been a member of the club since 1978, only two years after its founding and is 39/40 in assisting at the Midwest Horse Fair Morgan promotion. Jim not only has a long personal resume of Morgan activities, including serving as the Morgan representative on the Wisconsin Horse Council, but represents his family’s legacy in the Morgan breed. You can read their personal stories about the Morgan breed in the March newsletter. You can also read a Katz Chats with Katryna Endres and read up on the YOUTH SAFETY AND SHOW CLINIC that Sarah Kygeris and Isabelle Abderholden are sponsoring on March 23rd. Wingait Farm is also holding a safety clinic on March 30th. Contact Anita Fanscali for more information. Posted on March 15, 2019 by Heidi Harvey. There is plenty of reading for those -30 degree nights and you can find out how the members are coping with our challenging winter weather in the January and February newsletters. The January newsletter contains the membership form which was due January 31st and which we need to get back to Deb Fairbanks ASAP. There are some pretty photos of the Lights Parade in Baraboo and you can read the first installment of “Katz Chats,” where Katz Jackson provides us her interview of member Denise Marino. Mary Ellen is still looking for a dressage, side saddle, reining or other speciality horse to round out our presentation at Horse Fair. The February issue has the budget for 2019 and Katz Chats with members Marsha Valance, Isabelle Abderholden, and Jim and Bev Harris. Jeff Heise has also published the prize list and other show information for the club charity show, which will be held June 15th and 16th, in the January newsletter. Posted on February 16, 2019 by Heidi Harvey. Our next meeting will be in October, date and location to be determined. As noted in the September newsletter, it is time to think about a slate of officer nominations for the coming year. Mary Ellen is also anxious to receive your reports and get pictures of your summer activities and news by the 24th of the month for the October newsletter. Posted on September 9, 2018 by Heidi Harvey. We hope everyone enjoyed summer despite the wet turn in the weather recently. Read up on the club's parade activities and the results of the club show in August's newsletter. You can also follow this link to see the results of the 2018 show. Thanks to all the volunteers and participants and especially Jeff Heise, our show chairman, for another successful show! Catch up on early show results and all the foals in the May and June newsletters. There will no newsletters in July and August but that doesn't mean we don't want to hear your news and see your pictures. Send along photos and news to Mary Ellen Gray and Heidi Harvey. We will post events and updates to the web page and publish your stories in the fall. And if you are looking for past newsletters, just check out the new Archives page. Posted on June 10, 2018 by Heidi Harvey. 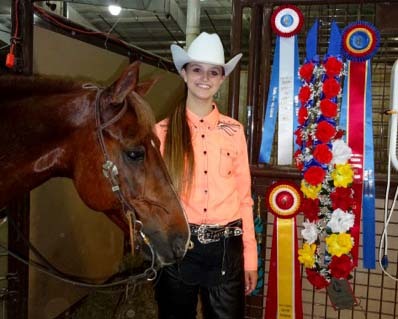 The club sends it congratulations to member Susie Weiss and her park gelding, Cosmos Double Oh Seven, on a big win at the Michigan All Morgan Show in East Lansing on Memorial Weekend. Double Oh Seven, with Jessica Cavanaugh up, won the Park Saddle Stake, besting last year's World Champion Park Saddle Horse. He was also reserve in the Park Harness Stake. Susie got the red ribbon in each of her western dressage classes with Cosmos Raphael and her youthful groom, Airi Rich, was invited to participate in the Michigan Youth of the Year and got awards for her achievements on the written tests. What a great start to the show season! 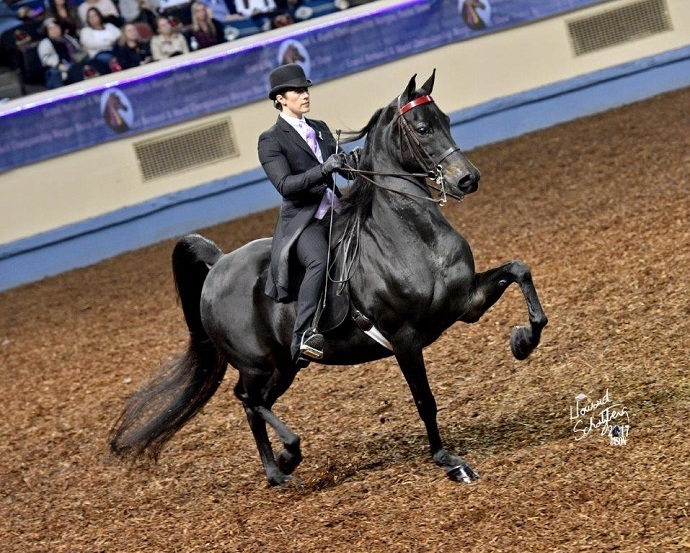 Congratulations to member Brooke Ace, who won the AMHA Gold Medal in Reining Seat at the 2017 Grand National and World Championship Horse Show. Congratulation to Sheri Haviza and Sami. who were Prelim. Champions at the Indiana Combined Driving Event in 2017. Congratulations to Jackie Sweeney whose beautiful 2-year old stallion, HyLee's Letterman was NCMA Futurity in Hand Champion, and whose 2-year old gelding, HyLee's Spotlight was NCMA Futurity Two-Year Old Gelding Champion and Two Year Stallion Champion and Two Year Old Pleasure Driving Champion. Better watch out for these youngsters in the 2018 show ring! WMHC Wins Midwest Horse Fair Barn Award! We are very proud to announce that the Wisconsin Morgan Horse Club won the Barn Award for best display of theme at the 2016 Midwest Horse Fair. This is the second time in three years that the club has won this award, and the lion's share of thanks goes to Lauraine Smith, our Midwest Horse Fair coordinator for the past three years and her vision of Morgan promotion and hospitality, as well as our wonderful human and equine participants and volunteers. You can read about our participants on the Midwest Horse Fair page. 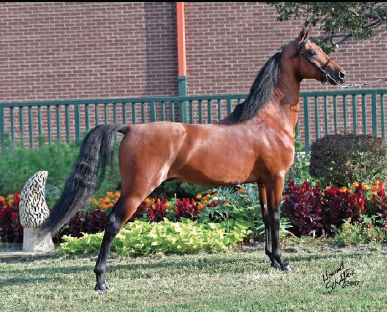 We are already mulling over ideas for next year's Midwest Horse Fair theme: Wonder Horse! Posted on April 19, 2016 by Heidi Harvey. The Wisconsin Morgan Horse Club wrapped up a very active 2014 parade schedule with the always fun, sometimes bitterly cold, Holiday Lights Parade in downtown Baraboo, on Saturday, November 19th. 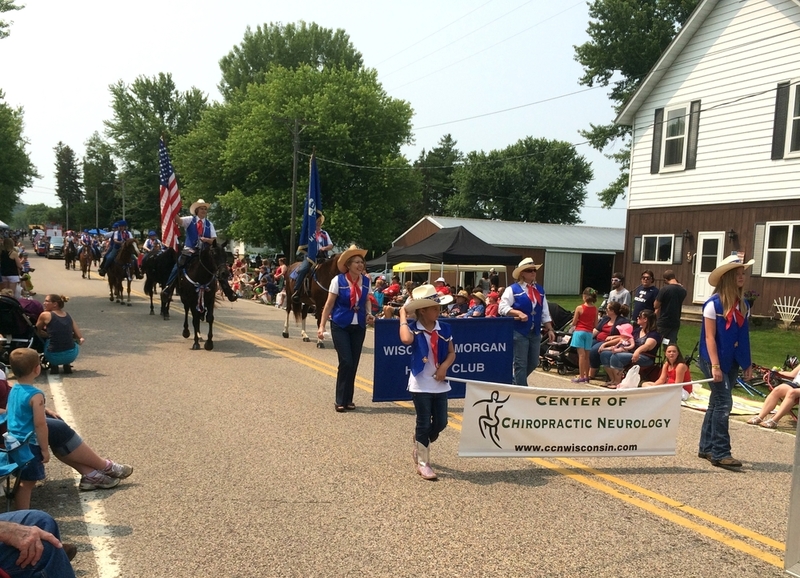 The parade kicked off at 6 p.m. with riders and horses decked out in lighted breastplates and garland. This year's parade weather was mild. A special thanks to Darcy Overturf who organizes the club's many parade appearances throughout the year and new club member Patty Keeler who drove all the way from Marengo, IL, to participate. A YouTube video of the parade posted by the Baraboo News Republic is available here. The club entry is in the first minute of the video. Posted on November 26, 2014 by Heidi Harvey.